Nine hundred miles in and we've grown to love the comfortable and practical cabin of our Transit Custom Sport. Admittedly, knee room is a little snug for tall drivers, but it is difficult to deny that our big orange van is a comfortable box on wheels. The driver's seat is one of the best of any van we've driven, with the eight-way adjustment and firm cushioning making it easy to get comfortable for a long slog behind the wheel. Our only criticism is the steering column, which cuts leg room and makes it painfully easy to catch your knee as you get in and out of the van. 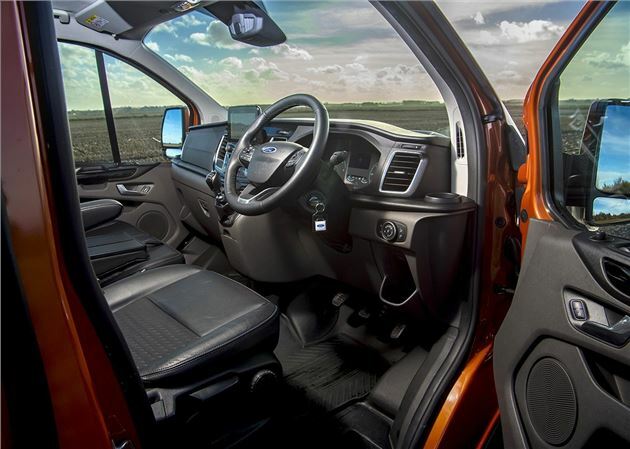 Bruises aside, we have very few complaints about the interior of the Transit Custom. The dashboard has lots of useful pockets and cup holders, while the three-tier door bins are brilliant for storing bottles of water, loose change, mobile phones or loose bits of paper. The glovebox is also large enough to take a hardback A4 document holder. Coat hooks - or lack of them - are an area that really annoy us in the world of vans. After all, there's nothing worse on a wet, winter day than having nowhere to hang your soaking jacket. This is an area where the Volkswagen Transporter falters, with coats usually sliding off the passenger's seat and onto the muddy floor. Thankfully the Ford gets a pair of coat hooks, along with under seat storage that has enough space for a pair of hard hats and set of overalls. ﻿﻿﻿﻿The Tardis-like interior is perfect for swallowing up daily essentials, with the highlight being the smart, three-tier doors. The Transit Custom has three seats and the backrest in the middle folds down and doubles up as a work table, which is useful for writing out receipts or tapping away on a laptop when parked up. The van also has a pair of 12V sockets for laptops/tablets and two USB charging points for mobile phones. Fuel economy is holding at around 40mpg, with the van carrying light loads and two adults, which makes it relatively good value for long runs. We recently took the van on a long run to Manchester, Liverpool and Birmingham and economy only dropped by a couple of points when we half loaded the van with some bags of sand and cement. Motorway driving is a comfortable experience, with the 170PS TDCi diesel content to sit at 2500-3000rpm at cruising speeds. The high torque also makes it easy to shove the van into sixth gear and keep it there for the duration of the motorway run. Both the door mirrors have blind spot monitoring, and this is standard across the entire Transit Custom range. These work with a yellow LED light illuminating whenever a vehicle is detected alongside the van. The system also picks-up cyclists, which is really handy when driving around town for short runs and multiple drops. Admittedly the blind spot on the van isn't that large, but the blind spot eliminator provides peace of mind that, should someone nip up the inside, you'll get a timely warning before attempting a turn.